1. I can bring as much stuff as I want. The only consequence of over-packing is having to bring it all back in the house when we come home. 2. I have my own food. While we still tend to eat lunch in the parks and occasional dinners out and about in the World, it’s nice to be able to have real bagels, eggs, bacon, or whatever we’d like for breakfast at a fraction of the cost. Plus it takes less time for me to just cook it than to load up on a bus somewhere to get it. The same goes for snacks and drinks…especially of the alcoholic variety. 3. The activities at Fort Wilderness are the best. On a two-week trip there last year, we absolutely spent a few days just hanging out in the campground. There was the daily craft at the pool, the great pool complex, a visit with the horses, a bike ride on the trails, campfire and movie at night, and the view of the fireworks, complete with music from the dock. The campground is a destination in itself. 4. The bath houses and laundry rooms are so clean and conveniently located. It almost seems silly not to do some laundry in the downtime, which helps out when we get home. 5. 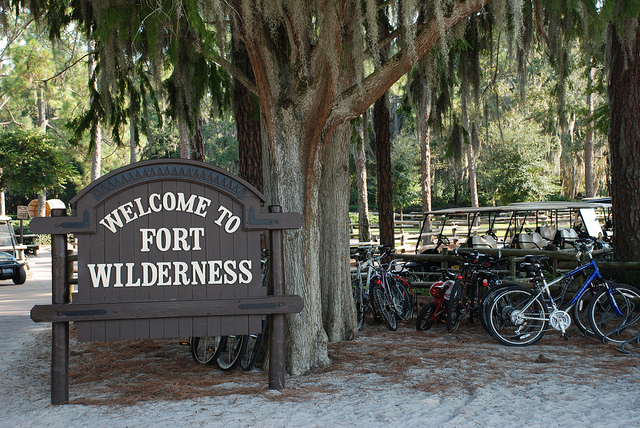 Fort Wilderness offers the easy ability to recycle. I’m ashamed, but sometimes while camping I’m far less environmentally conscious than I am at home simply because recycling isn’t possible unless you hold your bottles and cans and take care of them when you get back home. Sometimes I do that – sometimes I don’t. At Disney World’s Fort Wilderness, the choice isn’t necessary. There are recycling posts located in each loop. 6. Call me boring, but I just like my own stuff. This even holds true for potty stops to and from Disney World. There’s zero anxiety about the cleanliness of a bathroom in a gas station when you’re able to pull over almost anywhere with adequate space, hop out of the truck and into your trailer to use your own potty. Couple that with the ability to grab anything you need for the next leg of the trip (food, water, new DVD, stuffed animal, pillow – okay, our truck gets a little crowded) while you’re in there and I almost want to travel with the RV even when we’re staying in a hotel. Kidding, but just sort of. 1. You can not reserve a specific spot, and that makes me nuts. You can request what you want all day long, but there’s only a possibility that you’ll get it. 2. Free dining isn’t offered to campers in the campsites. This also makes me crazy. I understand it is likely because 1) campsites are relatively inexpensive, 2) each site accomodates up to 10 campers, and 3) campers typically have the ability to prepare their own food, but, I still feel discriminated against. I wish they would offer it with limits. Perhaps we just get up to four free dining packages per campsite? Or only the quick-service option? I don’t know, but I sure wish they’re reconsider. 3. Towing the RV produces a pretty bad miles per gallon number. That makes fuel a considerable expense. 4. The Fort Wilderness campground is huge. In almost all cases you’ll need to take a bus to bus or bus to a boat to get to a park, extending your travel time. 5. While this may be related to the times of year we’ve camped at Fort Wilderness (May, June, and December), the bug situation can feel a little burdensome. In May and June the yellow flies, which will actually get back up and bite you again when you slap them off, have been so bad that it wasn’t enjoyable to sit outside. Bug spray is necessary and works pretty well. 6. The clean-up, as with any RV vacation, is more than a resort vacation. I sometimes dream of returning from a trip and not having to wash bedding and towels and mop the floor.